Masters of the Universe #6, “From Here to Eternia,” is written by Mike Carlin and illustrated by Ron Wilson and Danny Bulanadi. Here, Skeletor sabotages the monorail around the Three Towers in an attempt to capture Central Tower (which is referred to as “Eternia” here). This issue begins with the words “Holy swamoli.” I don’t know where Carlin learned words, but he needs to learn some new ones. Unfortunately, it doesn’t get much better, and one of the biggest flaws is the plotting. Skeletor’s stated goal at the outset is to take control of Central Tower. By the middle of the issue, he’s succeeded, but he doesn’t do anything with the opportunity, and by the end, he’s trying to destroy it. Here’s more disregard by Carlin of established origins. The skyway around the Three Towers is Man-At-Arms’ invention, defying the how and why of building a mass transit system with a stop at Skeletor’s lair. The Heroic Warriors are operating out of Central Tower, which is nowhere near Viper Tower. Man-At-Arms is oblivious to most everything around him. Snout Spout takes great pride in his heroic window washing. Bulanadi’s inks are fine; they don’t differ from Janke’s enough to be particularly noticeable, and the art is otherwise as usual. However, there is one horrendous error. Throughout the issue, Central Tower is depicted as being in a clearing, as is proper, and next to Grayskull Tower. But in the two-page splash of He-Man and Skeletor’s dogfight, all of a sudden it’s in the middle of the palace grounds. 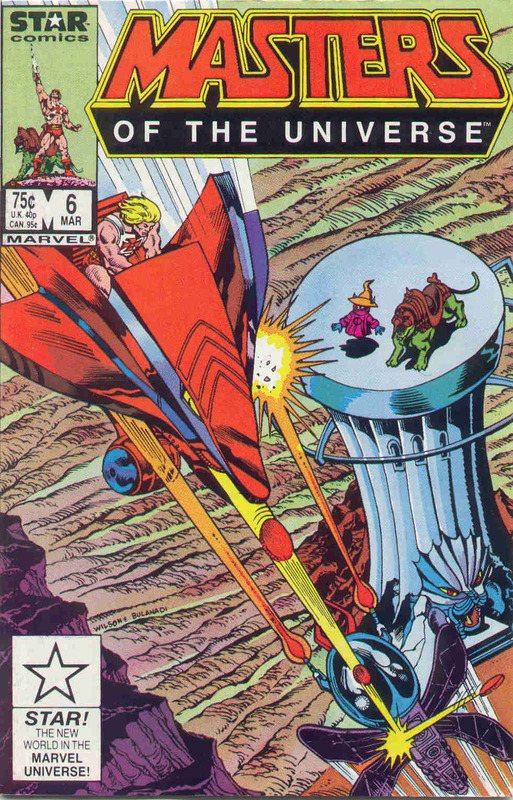 A lot of toy promotion and a lot of nonsense – it’s not altogether unentertaining (a little Evil Orko goes a long way), but we still aren’t anywhere close to a good comic.